Shoot enemies and avoid being shot this general premis is the basis for a large percentage of video games. 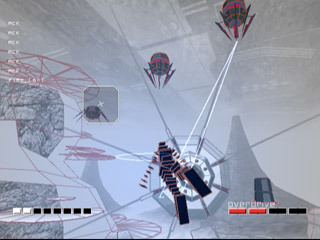 In some form or other shoot-em-ups involve shooting things with 'em' being short for 'them' as there is usually more than one enemy to be killed. Its a trend which started early on with Space Invaders and doesnt look like stopping, I guess we just like shooting stuff. Here we look at some of the best from the last 25 years with some important developments in video game history. One of the first and most popular arcade games of all time. 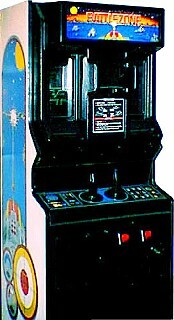 It had the first animated sprites and the first game to keep a high score. 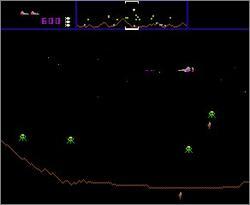 Unlike Space Invaders, the enemies in this game leave their positions in line and attack in groups of 3 swooping down towards you. This is a basic feature of most shoot-em-up games from then on. Enemies basically get more and more advanced in the way they try and avoid / shoot you. The first 1st person shooting game. Used wire models on a vector display for a tank battle with opposing tanks, missiles and the occasional saucer. Paved they way for the classic Star Wars Arcade. Supposedly used by the US military in early experiments with training simulations. 1st game to have multiple levels.five separate missions. The first mission is like Space Invaders. The second mission pits the player against two squads of diving ships, each squad has a special ship that fires long laser beams. The third mission is like Galaxian. The fourth mission has the player fight a number of enemies that spiral toward the player shooting fireballs. The fifth mission has the player fight the Gorfian Flagship. The Flagship's shields must first be battered down, then the player must hit the Flagship in a tiny exhaust port in order to destroy it. Zaxxon, took scramble and added another dimension (left or right), it was very similar in concept but with great graphics and a playable game sega were onto another winner. This was the first isometric 3D game. A true arcade classic that has been converted onto just about every platfor ever including the spectrum. There are 3 main arcade versions 1, 2 and Leo. Nothing revolutionary about the r-tpe series but they are all very polished games with some great end of level bosses. At first glance Raiden may not seem that special but it is a superb example of a vertical scrolling shooter. Graphics are simple yet superbly detailed. 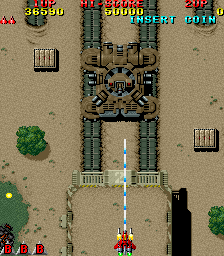 Some classic end of level bosses such as the giant walking tanks on stage one of the DX version. There are a total of 6 games with the last being Raiden Fighters Jet. Konami produced some of the best games on the SNES and Super Probotector is probably the best of the lot. Up to two players blast through 6 amazingly varied levels of side-on or top down action. Good music really pushes the game along. There are loads of bosses from start to finish making great use of the SNES mode 7. An essential part of anyones SNES collection, still plays well today. One of the finest games on the N64 never to make it to the UK other than via import. Its an on-rails shooter much in the vein of starfox. Very cool Manga style graphics and story line. A classic game from treasure the dev house which brough us Gunstar Heros and Raidient Silver gun. Inventive gameplay, Incredible music, Wonderful visuals, Lots of replayability despite most extra levels to be found being variations on a theme. Shots can be timed with the music.